One of the biggest challenges you have to overcome as a blogger or webmaster is prove to your audience that you are an expert in your niche. It is important to pass the message to your readers that you know what you are talking about so that they can trust you. Trust is what will convert readers to loyal readers, followers or customers. A successful web site or blog depends on the quality of the content. I’ve said it before that content is still king and you can have success with or without SEO. To create good content you need to have a passion for the particular niche. Passion is over and above expertise and this is what distinguishes a good web site from an exceptional site. What happens in the cases though when you are not a ‘true’ expert in a niche but still want to run a web site on that subject? There are different options available and this is what I will be discussing below. This may sound weird but one of the opportunities the Internet creates is the ability to hire an expert to help you cover the cap between good content and exceptional content. Whenever I discuss about this method with other fellow bloggers or even clients I get many questions and concerns on how such a process can work. Basically you will have to play the role of the entrepreneur and approach your web site or blog in the same way you would approach a real business. In the real world when a company needs skills in a particular area it hires an expert or it outsources to another company. This is exactly how it works in the offline world too. Where can you hire experts? There are many web sites that bring contractors and workers together. Web sites like odesk.com, freelancer.com, peopleperhour.com are great places to start looking for your experts. You prepare the job description explaining what the job is about with as many details as you can and you ask the interested parties to apply for the job. You can add some restrictions on who can apply, for example apply only if you can prove your qualifications or if you can prove your previous experience etc. At this stage don’t mention anything about salary. You register for an account and post the job opening on one (or more) of the sites listed above. In a few hours you will start receiving applications for the job. Depending on the type of expert you are looking for, you may get hundreds of applications so you need to be prepared to manage them, filter them so as to find the right candidates for the job. It is certain that many applicants are not suitable for the job at all and they apply without reading the requirements so you need to be careful to reject those applicants from the beginning. The next step is to create a short list of 3-4 applicants and start talking to them, asking questions and in short doing the ‘interview’ process as you would in the real world. In this stage you need to look at their qualifications, previous work experience, portfolio, availability etc. What I do next and before choosing who to hire, is a short pilot with the applicants that made it to the short list. In other words I give them more details about the job (including payment details) and invite them to participate in a short paid pilot. In the pilot I simply give them one or two titles and ask them to write the articles. The applicant with the best work is hired for a trial period of one month. You may choose to follow the same process as above or come up with a completely different process. What is important is to understand that you don’t have to do anything alone when running a web site or blog and you can always hire a real expert to fill in the cap. If you don’t want to hire an expert either because you can’t afford to and you don’t want to take the risk or because your niche is very specific and there are no experts available or they cost too much, then there is no other option than becoming one! How can you become an expert in a niche? Find out who are the ‘experts’ in your niche – Search Google for your niche and find out who are consider the leaders / influencers and follow them in all social media channels (Twitter, Facebook, Google+ etc). Do your keyword research and find out what to write about – You should learn how to select your blog titles cleverly so that you increase your chances of ranking higher in the search engines. Practice makes perfect – This is true in the online World as well, the more you write, the more content you publish online, the more interaction you have online the better you can become. So, start producing content about your niche and always have in your mind that quality is much more important than quantity. If writing is not your best friend there are alternatives – If you think that you have the knowledge for a topic but your writing is not good and can’t get it better you can hire a copywriter to fix your mistakes or look for alternatives to writing like producing a video, a slideshow, a podcast or an info graphic! Refresh your SEO skills – Don’t forget the basic SEO principles when writing content. Your focus should be on content but SEO can give your good content a real boost and value. What does this tell us in the online word? First that you need to show off your expertise in your writing and second that you need to show off your trust in your social media profile. In other words, an expert is more likely to have followers in various social media channels which is an indication that people trust him. Think about it this way, would you trust someone with a few followers as an expert in a niche or someone with thousands of followers? If you have expertise in a niche you need to prove it by producing great relevant content and by working on your social media profiles. 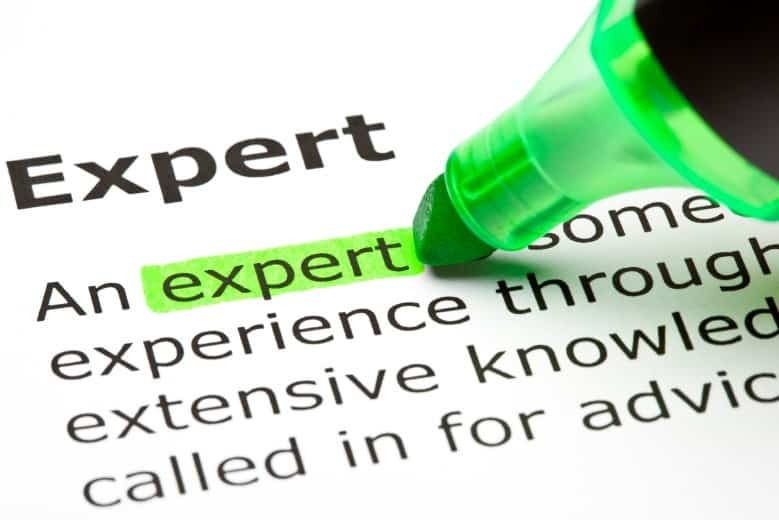 If you lack expertise then you can either hire an expert of fill in the cap or try to become an expert yourself by building new skills. Either way your goal is to establish a tunnel of trust between you, your website and your users.